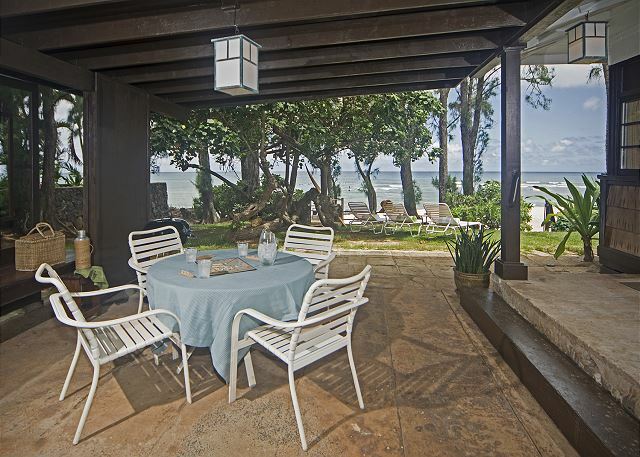 Welcome to The Captain’s House, a historic home that sits on one of the most stunning beaches on the island! This newly renovated home has three bedrooms with a/c, a designer kitchen, and lots of outdoor areas for dining and lounging. A wall of windows runs the length of the home, affording endless ocean views and allowing soft sea breezes. 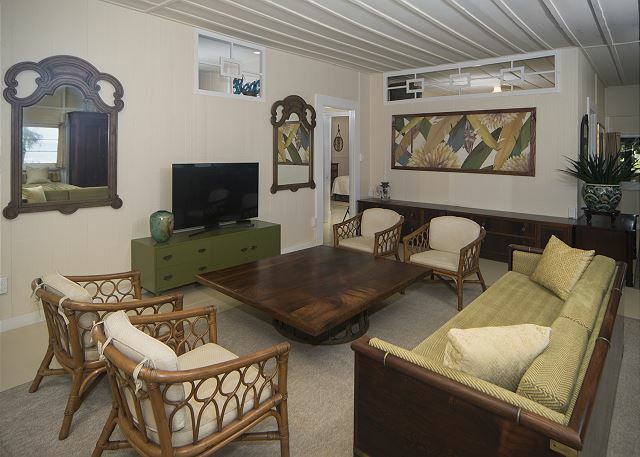 The Captain's House has a covered lanai for outdoor dining, and the sun deck overlooking the beach is the perfect spot to watch the sun sink into the Pacific every evening. 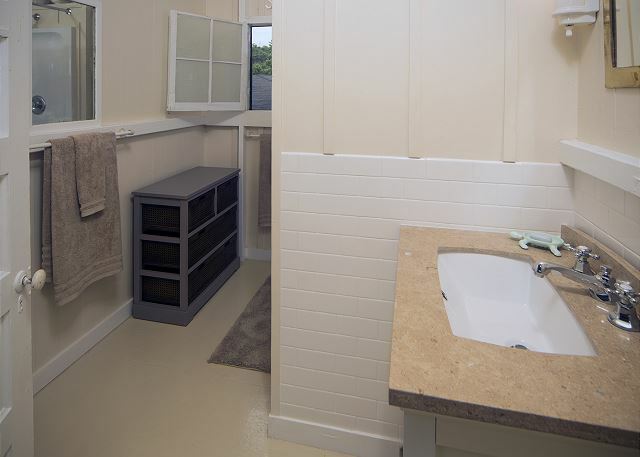 Other amenities include wi-fi, TV’s and a/c in every bedroom, privacy fence with gate, off street parking, washer and dryer, BBQ grill & outdoor shower. 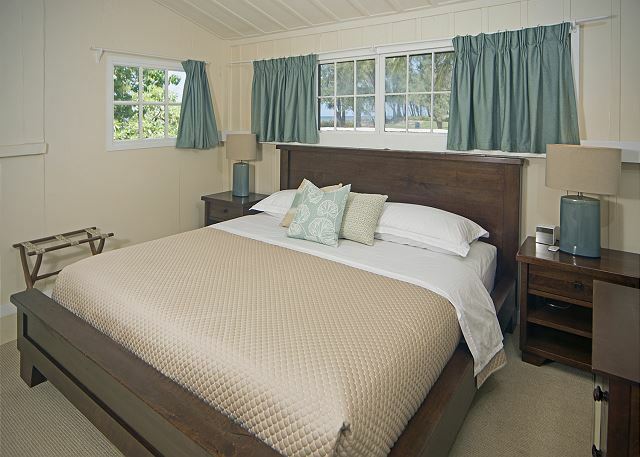 Home sleeps a maximum of 8 guests; please see below for a detailed description of bedrooms.- THE HISTORY - This home was built by Captain McClay in the late 19th century. 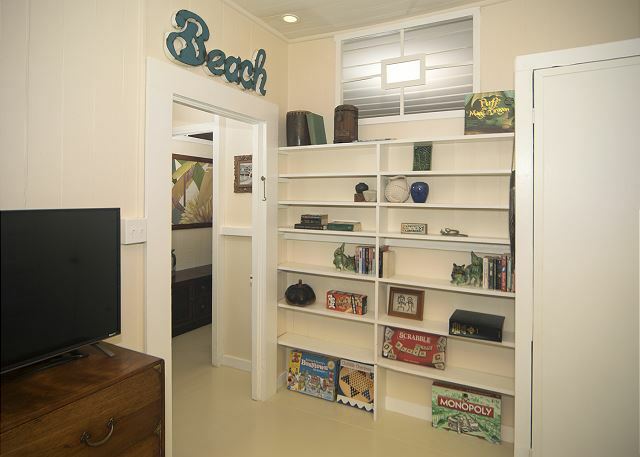 On a trip to Hawaii from the East Coast, the Captain used as ballast the lumber he would eventually re-purpose to build one of the North Shores first beach homes. 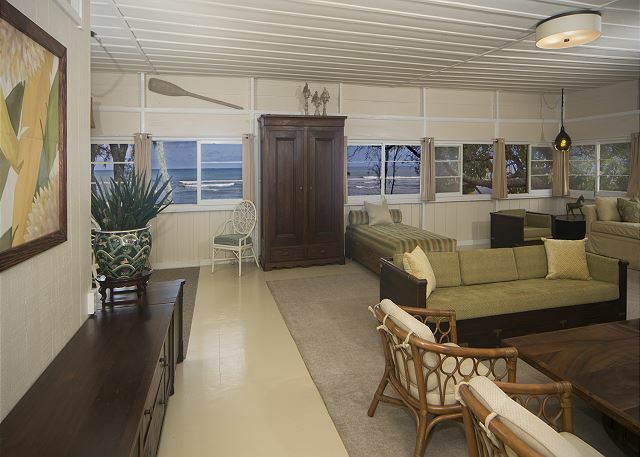 He chose a protected beachfront area unrivaled in beauty to build upon. 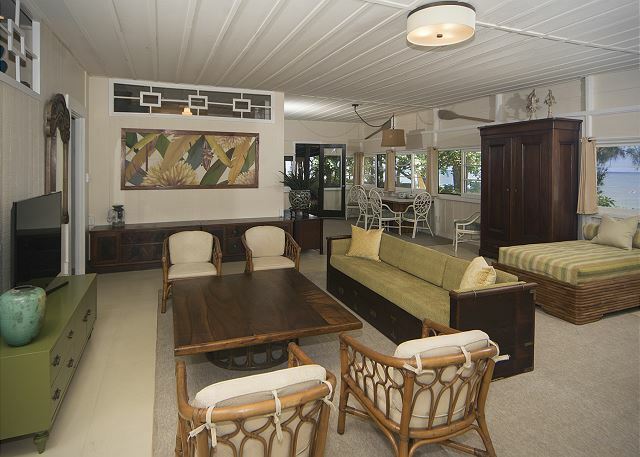 For generations it was home to the Captain’s descendants, and the current owners have been caring for the home since the 1960’s. 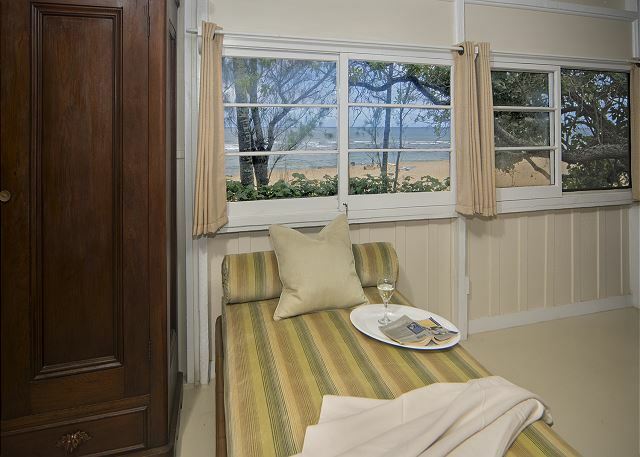 For the first time in its history, the Captain’s House is now available to island visitors. 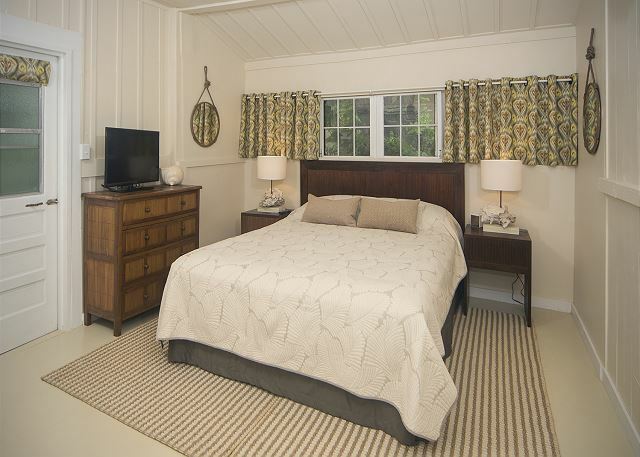 The home has been carefully restored and modern amenities added; including a renovated kitchen and a/c in every bedroom. 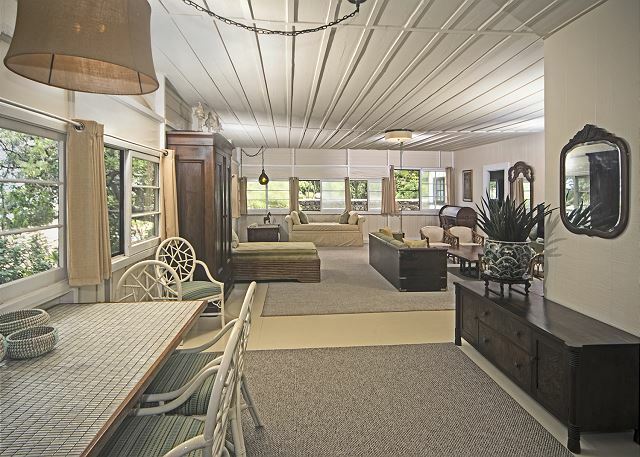 In decorating the home, the owners kept all original furnishings that were custom to it. 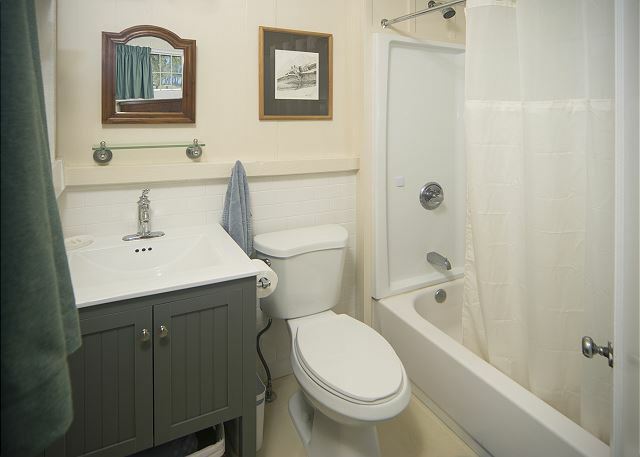 There are original vintage fixtures along with new, as to show the natural progression the home's age. There is a piece of furniture in the home representing every decade from 1920 on! 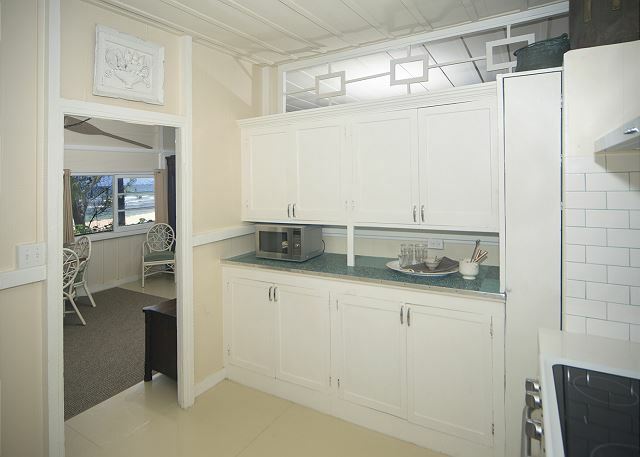 The Captain’s House is filled with local art, including that of the Captain’s granddaughter, Emily Giese, a ceramicist whose work can still be seen in the kitchen and dining room table tile, and also in concrete work outside. 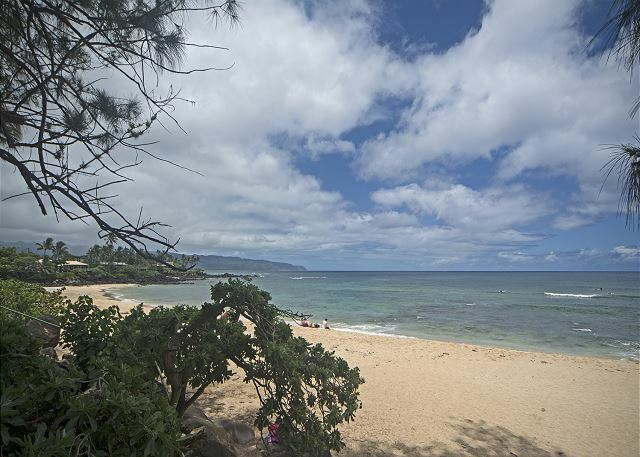 Chun’s Beach is an absolute favorite among locals and those in the know, yet never crowded. The location is prime – the spot was chosen not only for its beauty, but also for the protection provided. 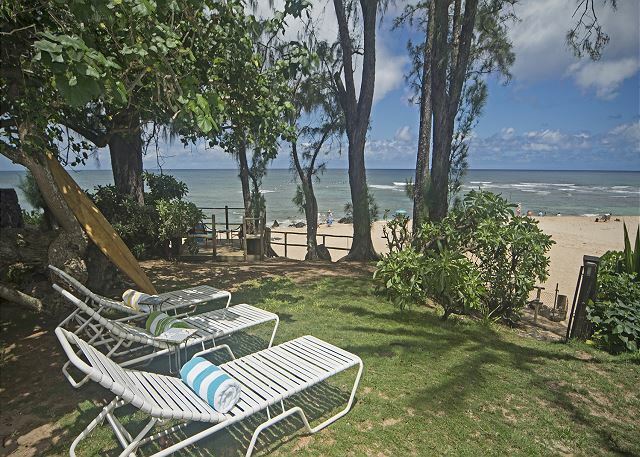 Many homes advertise as being located at Chun’s beach, but The Captain’s house is one of only three that actually enjoys this privilege. 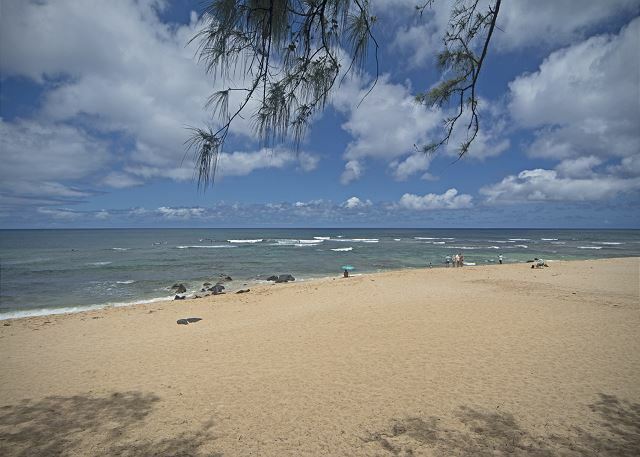 The beach in front of the home is wide with soft sand. 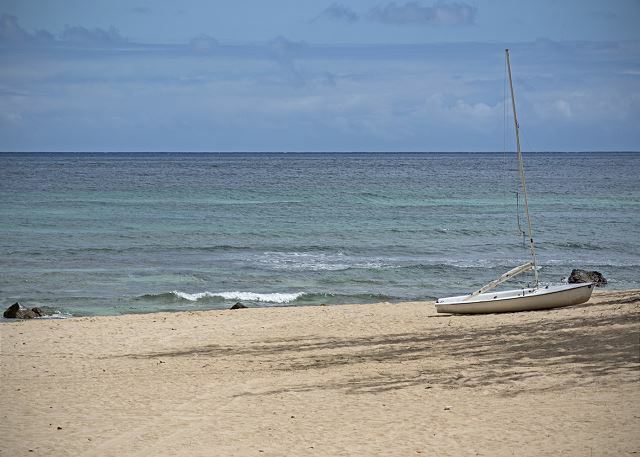 During calm weather the swimming and snorkeling are divine, and you will find sea turtles bobbing next to you in the water regularly. 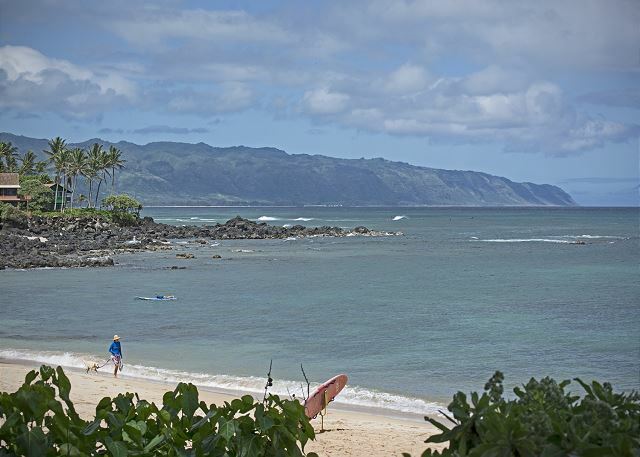 Close by surf breaks are Chun’s, Lani’s , Holton’s , Jocko’s and Leftovers. 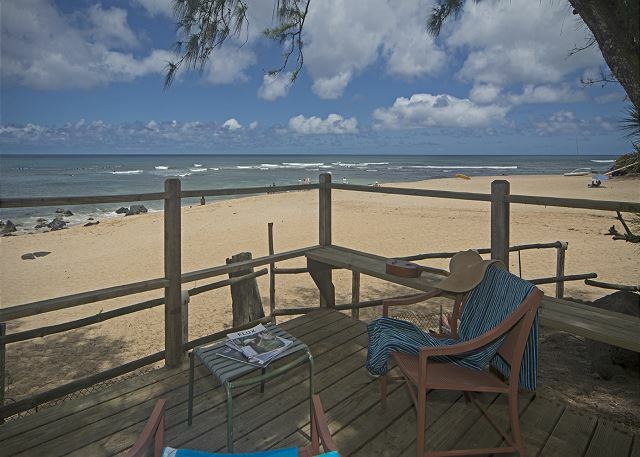 Waimea is a mile down the road, Sunset Beach just four miles away. Other: There are two single/twin size day beds in the living room. Pack n plays, cribs and kids beds can be rented and delivered. A/C in bedrooms only. We spent 10 glorious days at the Captains House in February 2019. 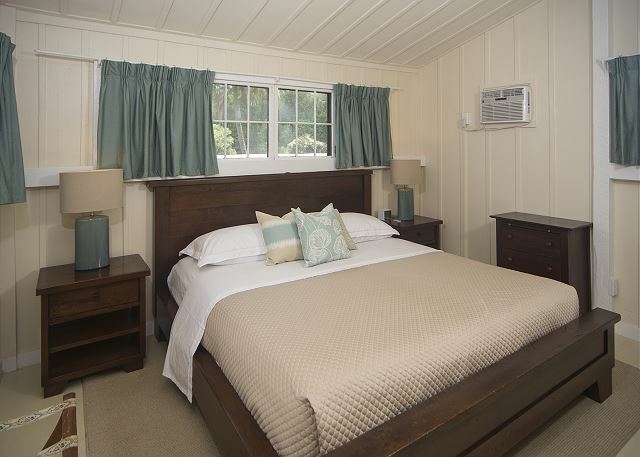 We appreciated the history of the house and absolutely loved the charm and "family-friendly" nature of the property. The large living room with lots of comfy furniture allowed us to enjoy our family reunion, with family members traveling from the US, Canada and Australia. We loved being able to see the surfers right out front and often sat out on the deck watching the sunset. 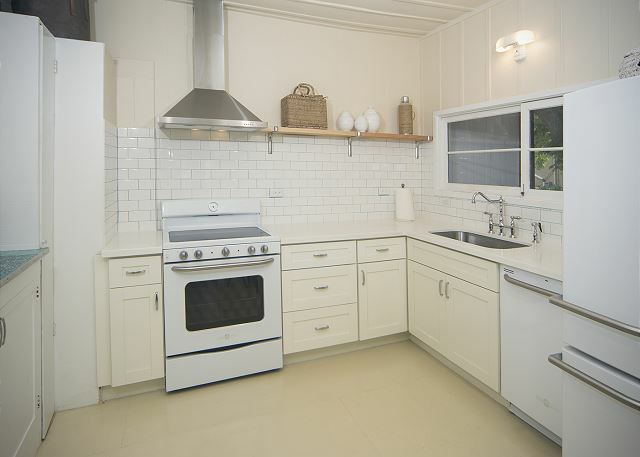 The kitchen had everything we needed and it was great to have a washing machine and dryer. The house was immaculate when we arrived and the owner's seem to have thought of everything down to extra beach towels and a pantry well stocked with sauces and spices. 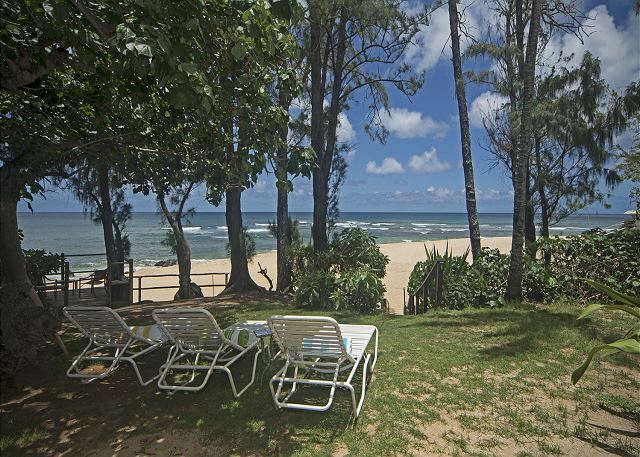 The location couldn't be better ... only a few minutes drive to Haliewa in one direction and a few minutes to Waimea Bay in the other. We rented from Hawaii Beach Homes 10 years ago and went through them again this time. They are very helpful and responsive and again they made everything seem easy. 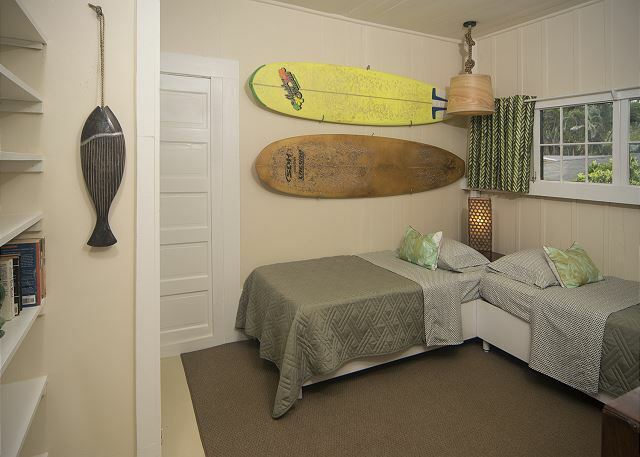 If you are looking for somewhere to stay on the North Shore that is a little nostalgic and a little retro, but still really comfortable and easy to live in, the Captain's House should definitely be on your short-list!. Manager Response: Thank you for staying with us, David, and mahalo for taking the time to leave such a detailed review! You have described the home and the location perfectly. If prospective guests have any questions please don't hesitate to contact us, we love helping visitors find the perfect home for their families. Perfect location. Steps to the sand watching surfers and sunsets from inside or outside the house. So happy with everything !!!! Loved the character of the home! Couldn’t have picked a better location. Thank you very much! Great location. Everything needed for a great business trip. Stunning view of beach! Not for swimming, but saw a lot of surfing (Chun’s Reef) Sunsets were awesome! 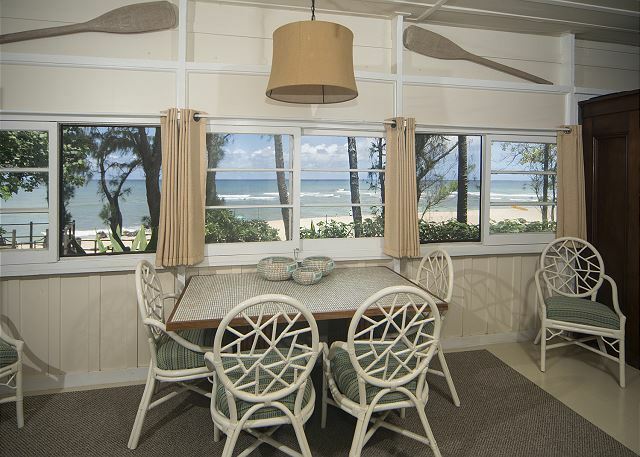 Very close to Haleiwa town, great restaurants & shops. Short drive to Foodland for groceries & wonderful Food Trucks. The house was very clean, comfortable & quiet. Kitchen wonderful everything we needed, redone very well. Perfect for 4 adults & 2 children. We felt safe, kids played outside in fenced property, knowing they weren’t allowed on beach without adult. Tons of beach towels & beach toys were terrific! Keep in mind that this house was built in the late 19th century, but is very well kept with a lot of charm. Outside entrance could use a little TLC & windows/screens need a little attention. But view from those windows, Awesome! A/C in bedrooms great, no A/C in living room. It did get a little warm at times, but opening all windows in evening for ocean breeze helped. The only concern was driving in through the gate. It was a little tricky the first time. There is no real drive way outside the gate. We found it was best to pull over across the street & have 2nd person open gate to drive in safely. We had a excellent stay & felt it was perfect for our family. Management was great, responsive to our needs. Loved Captain’s House & Location! The Captain's House is a wonderful property. The home, as described, is clean and spacious, but also truly unique. If you are looking for a cookie cutter, hotel like experience, this is not it. What it is, is warm and inviting. Our family of 6 adults found plenty of room for being together, but also for privacy. The air conditioning in the bedrooms was much appreciated, as it is very warm and humid, even in September. As far as access to the beach, all we had to do was walk out of the house and down some steps. There are some rocks in the water directly in from of the house, so you need to look out for them. But on both sides of "our" beach, there are less. 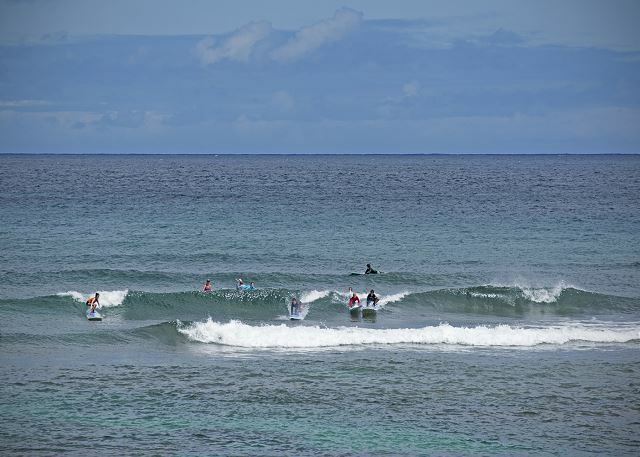 Multiple surfers were also surfing from morning to night. They were fascinating to watch. 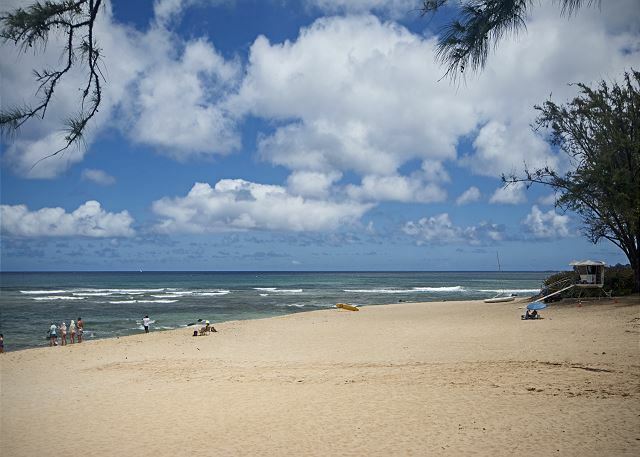 The property is also close to many Oahu attractions and other beaches. 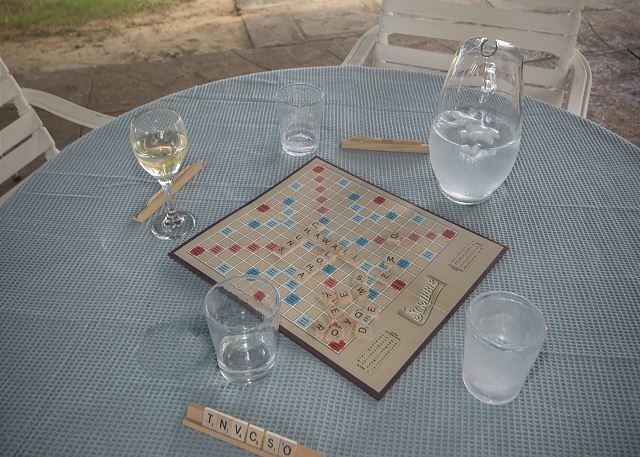 We truly had a wonderful time, and would go back in a heartbeat! Beautiful location, very well equipped. Exactly as described. We visited Oahu when Hurriane Lane hit the Hawaiian Islands therefore we spent a lot of time at the Rental and we still had a great vacation. Highly recommended! 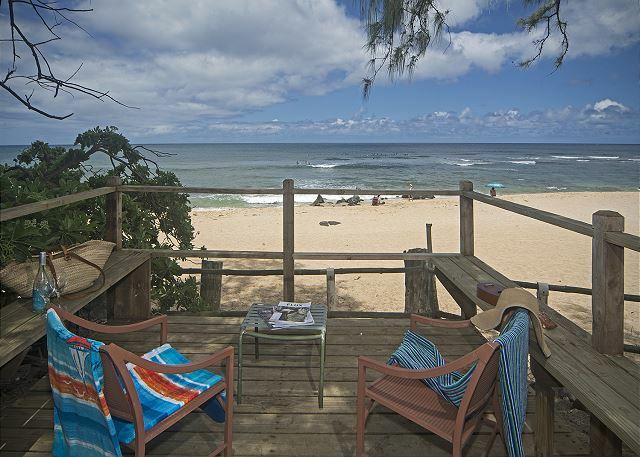 This is the perfect beach house to have relaxed days at Oahu North Sore. The house is spacious, light and very comfortable and clean. Everything works and the house has character. A place to feel like home. The location is stunning, just above the beach, which is easy to access via a few stairs from the garden. It is almost a private beach, very few people came there during our stay. There are a few rocks in the water, which might be the reason, that the beach is not very frequented. 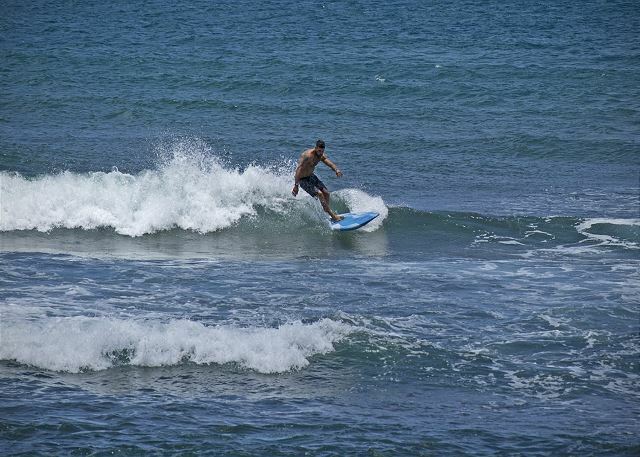 But with some attention to the rocks it is easy to get into the water and swim, snorkel or surf there. The street in the back of the house is very busy during day times. At night there is only very little noise from the street. 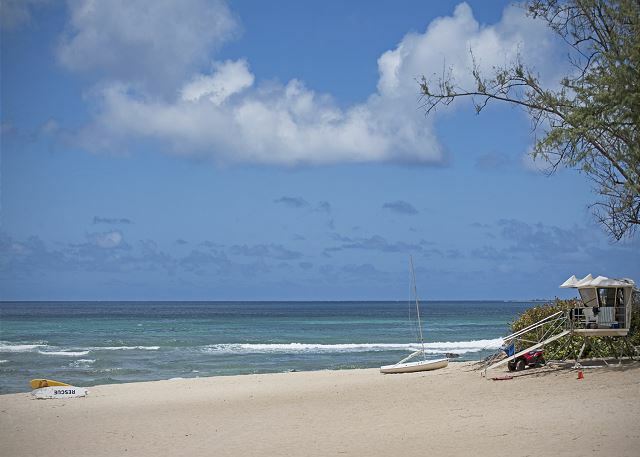 The nearby villages and beaches offer a big variety for shopping and activities. The service from the management was okay. I would recommend this house to other travelers and would love to stay there again.